Voting Members will have full access to all pages of the website, including membership pricing to conference and times of book voting, election voting, awards and leadership nominations. 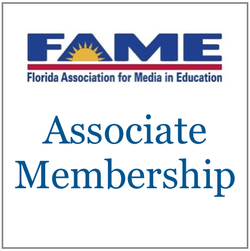 Active Members are persons engaged in the broad field of media education, including school library media personnel; persons engaged in the production, administration and supervision of media programs; and those involved in school librarian preparation. 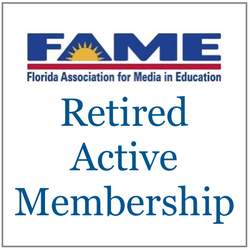 Retired Active Members are persons retired from active work in the broad field of media education. Associate Members are persons interested in promoting the objectives of the association but who are not eligible for active membership. Click the appropriate icon to join or renew your membership. 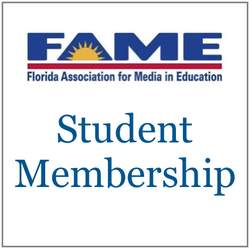 Student Members must be enrolled for at least 9 hours per semester in institutions involved in the preparation of media specialists. access to election voting or bylaw changes. Institutional Membership provides membership to multiple staff members at one school location. 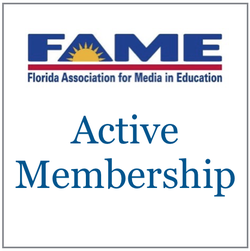 Anyone at your school can participate in FAME events, sponsor applicants for all FAME award programs, and attend professional development activities (conferences) at the member discounted rate. Signature Program Participation: For schools whose staff members are not in need of the full membership benefits of FAME but still wish to participate in Sunshine State Young Readers Award (SSYRA), Sunshine State Young Readers Award Jr. (SSYRA Jr.), Florida Teens Read (FTR) and/or the Jim Harbin Student Media Festival. Members will only have access to program pages and any voting associated with those programs. Members will not receive membership pricing to conference, access to election voting, awards and leadership nominations, or bylaw changes. For questions regarding payment options please email Vange Scivally. FAME reserves the right to grant complimentary voting or non-voting memberships.